It’s creating quite a following. GooseWaddle is an extraordinary new line of ultra-high-quality baby blankets that’s become an instant hit with moms nationwide. In addition to its grass roots popularity, GooseWaddle has received glowing reviews in numerous well-known parenting blogs and has also received the 2014 babyMaternity Retailer Top Choice Award and the 2014 and 2015 Family Choice Award. Meticulously designed and marketed by a North Carolina-based company, GooseWaddle blankets are available in classic pink, blue and white, and in full-size blanket and lovable "blankie" sizes. GooseWaddle even has its own mascot – Baby GooseWaddle, a plush toy that playfully brings the brand to life. 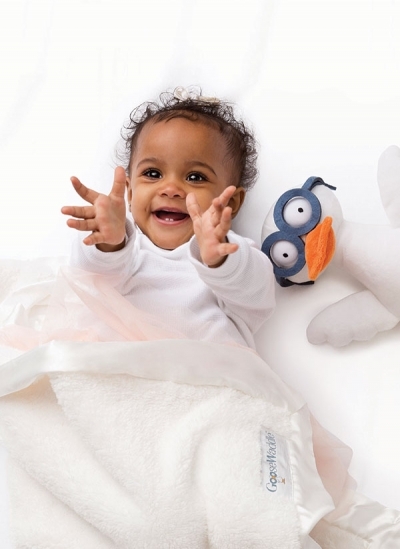 The creators of GooseWaddle also believe that infants everywhere deserve to be swaddled in soft, soothing comfort. So they’ve created GooseWaddle’s heart-warming “Buy 1, Give 1” campaign. Here’s how it works. For every GooseWaddle blanket that’s sold to consumers, the company donates a receiving blanket to a child in need, via a special partnership with a select group of charities worldwide. GooseWaddle is gratifying proof that when a company puts this much care into a product for infants, the smiles – and the success – just naturally follow.